My plans have changed along the way, from my initial Plan. I started this Ride in June 2011 from Portland, Oregon USA. I had an idea of the route, but as any adventure unfolds, there are changes. The map below is updated in Orange on the route I have been on. So far: 20 countries and about 68,000 Miles of riding so far. Currently in Australia and then planning on going to South Africa in September. This trip will keep evolving as I go. It is a chapter of life, and will unfold as it does. That is part of the beauty of it all. 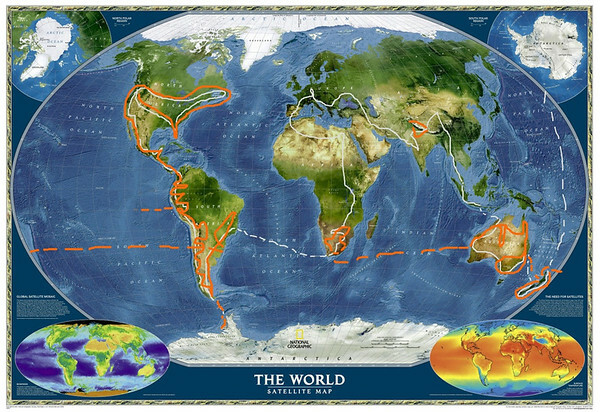 Here is the INITIAL PLAN posted June 2011: Here is a basic route that I will be riding over the next 1.5 -2 years. Lots of decisions to make along the way. It’s an adventure so I expect that it will change as I ride. I left Portland, Oregon on June 25th, 2011. My first destination was cocoa Beach Florida to see the Last American Space Shuttle Launch. It was great to see this part of history, and feel the sand rumble beneath my feet. Then to Key West, Florida before riding north to Nova Scotia, Newfoundland, and Labrador in Canada. To finish off my Summer riding in North America, I will be riding back to Portland, Oregon. Will switch to my newer and smaller motobike and start riding south through Mexico, Central America and into South America with the goal of reaching Ushuaia in Tierra Del Fuego Argentina. Once I am far south on roads as I can go, I plan on getting myself to Antarctic. Not sure how yet…. Then Ship the bike to South Africa and riding up Africa to Egypt to see the Pyramids. Again I am still researching the continent Africa to figure a route. After Africa, I will be making my way to India and China. and then hopefully to Australia, New zealand before making it back to the United States. This route is totally open to change as the journey unfolds. depending on safety, weather, time of year, and whim 😉 Follow along and find out where I go! Via con Dios mi amigo!!! Can you count the hits on radioman site? If so you are seeing many more since I have recommended your trek to others. I really am savoring your journey. How long will you stay in Portland after your Canadian leg? Hope you can reach Oregon w/o another tire change. This is so cool! I’ve always wanted to try something like this but never had the guts. Thanks for showing us how its done!